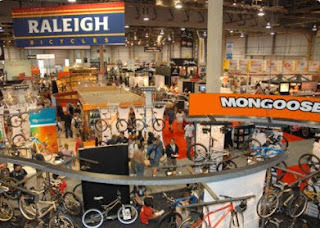 I'm off to the Interbike show in Las Vegas today. Not my favorite city, but it should be a good show this year judging by the number of manufacturers coming from Japan and Taiwan. The global economic downturn may be pushing manufacturers to make an extra effort to attend this year. I had planned on visiting Taiwan next month, but so many of the folks I wanted to meet with will be at Interbike that I may reconsider. After the show I'll be in Breckenridge for a four days, but the staff here will keep VO running smoothly. As I ask every year, what new products do you think should I look for at the show? 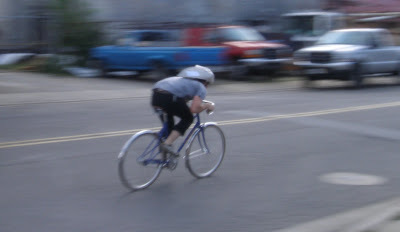 Our friend Joel Ralph at Bikeville has an interesting blog that's worth checking out. 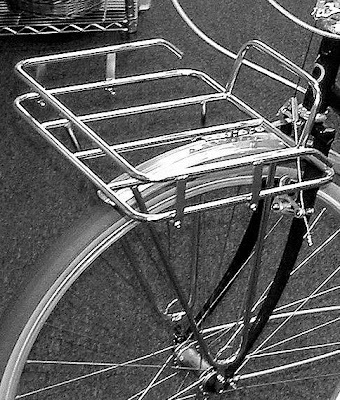 And: The first 50 Porteur racks have arrived. Once again we've accumulated a formidable pile of samples, seconds, prototypes, and parts used on showroom and demo bikes. There are even some old French components that I bought for research purposes. So Kyle has been assigned the unenviable task of sorting through everything and listing them on E-Bay. It'll take at least a few weeks to get everything listed. You can find all these treasures under seller name "veloorange". 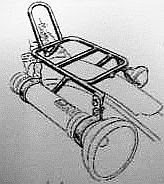 With the days getting shorter I've been thinking about bringing back the VO front rack-mounted flashlight. The model we sold in the past is no longer available, so we'll look for a new suitable light. I thought I'd write about some of the projects we're currently working on. We've just approved prototypes of the new VO hammered and polished fenders. 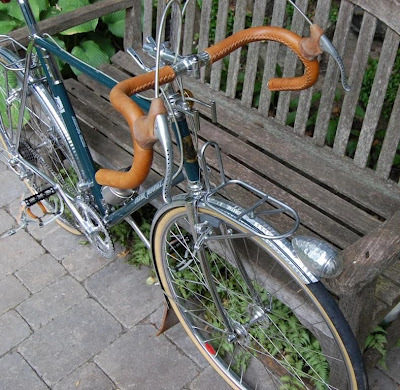 These, like Honjo fenders, are reproductions of classic French fender designs. They will initially be available in 45mm and 50mm widths for 700c wheels and 60mm wide for 650b wheels. More sizes are likely in the future. We are also working on three new VO bags. A new VO British-style saddle bag is in the prototype stage. It's shaped roughly like a Carradice Nelson Longflap, but a little narrower. It will be heavy black canvas with lots of brown leather trim, including leather edge tape and piping. It will be called the "Inverness bag". A small rack-top bag, the "Eclair bag" is also on the way. It will use the same materials. 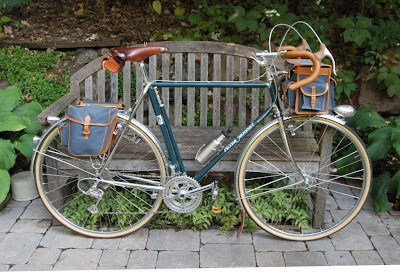 After months of indecision we have finalized a VO Pannier design. 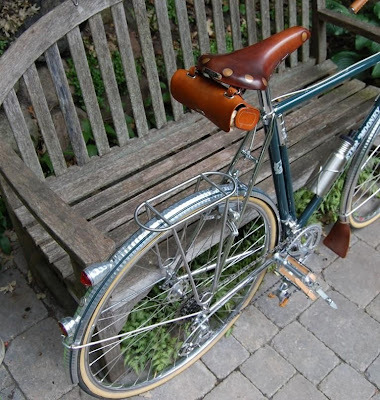 It will be in the general style of the Ostrich and classic French panniers and use the same materials as the other VO bags. It will be taller and narrower than the classic bags to provide better heel clearance. Depending on how many rounds of prototypes it takes to get these three bags exactly right, they may arrive in 4-6 months. The VO Rackaleur is close to going into production. 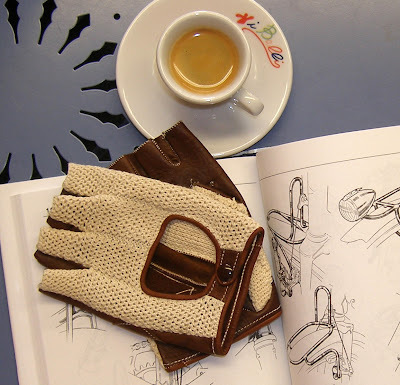 We will be working on a high end riding glove, as pictured above. Please don't ask me when the new parts will be available or how much they will cost. There are simply too many variables to give a reasonably accurate answer. VO cable housing and cable kits in various colors. VO squeal-free brake pads. These have received great reviews from everyone who has tried the prototypes, super stopping power and no brake squeal or your money back. VO threadless stems in 25.4mm size. I've posted photos of Gunner's bikes in the past. 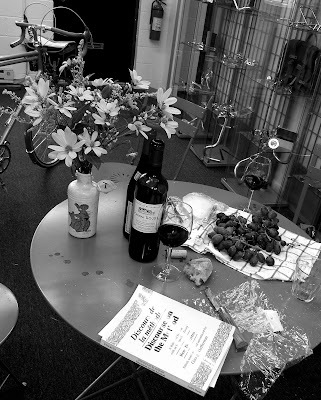 He's one of our oldest customers and bike stylist extraordinaire. Here are a few shots of his latest build, a recently repainted Mooney. Note all the VO parts, racks, bar covers, rims, toe clip straps, decaleur, extra long Honjo fenders, mud flap, etc. 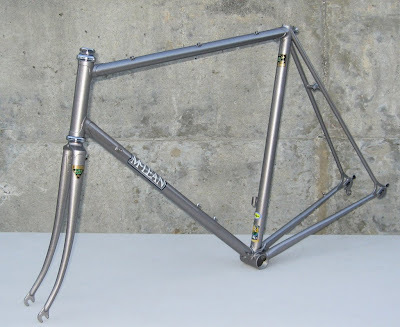 The last is a shot of his latest acquisition, a stunning silver McLean. Gunner's eclectic blog can be found here. 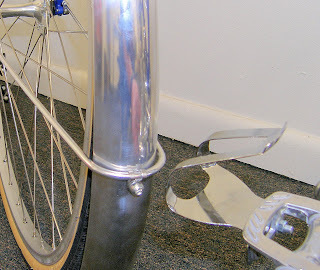 Installing fenders on some bikes results in toe clip overlap (TCO). When you turn the front wheel in a tight, slow-speed turn, your toe clip, or toe, can hit the front fender. This is especially common on smaller frames and frames with steep head tube angles. I've owned several larger racing bikes with TCO, but it has never really bothered me. I simply watch the position of the crank when turning at slow speed. In fact, the only time I remember experiencing it is when slowly circling while waiting for someone. Some folks, however, really hate TCO. One way to give yourself a little extra toe room is to replace the eyelet bolt on the front fender stay with an r-clip. This makes a lower profile attachment resulting in an extra 5mm of room. You can also drill a second hole and move the stay to a lower position. This latter fix doesn't look great, but it works. Finally, if you have smaller feet it's a good idea to try smaller toe clips. Fortunately, VO frames all have reasonably long top tubes and, being low trail, generous rake. This will minimize TCO as compared to most modern frames, but there still may be some on smaller sized frames. Do you think TCO overlap is important enough to make compromises in frame geometry to eliminate it? Or is it better to have the best possible handling and live with TCO on a small frame? Recent news in the outdoor industry has once again brought much attention and questioning about the presence of the chemical, bisphenol-a (BPA), in reusable bottles. In an August 19, 2009, article by SNEWS, popular bottle makers, Sigg and Laken, publicly acknowledged for the first time that every aluminum bottle made and sold by their companies prior to August 2008 was knowingly lined with an epoxy resin containing BPA. Many scientific studies indicate BPA has the potential to act as an endocrine-disrupter when ingested, and fetuses, infants, and children are most susceptible to develop negative human health effects associated with BPA such as diabetes, heart disease, cancers, infertility, obesity, and neurological disorders. Now I don't know if this is just aggressive marketing hype or a real concern, but I, and my family, switched to using only stainless steel water bottles a few years ago. In fact I own several aluminum (and some plastic) bottles that haven't been used in years; no point in taking chances with BPA. All this got me thinking, or speculating, about Klean Kanteen. It's an interesting business. These stainless bottles have been made for some time by several factories in China. The quality of some is very good, but others are marginal. I know because we've recently been looking at samples from several factories. Kleen Kanteen seems to import some of the better ones, puts their name on them, and markets the hell out of them. It's a nice Kleen business model and KK seems to have done everything right. I admire the company. But I see it as a business model with low entry barriers; it's not terribly capital or development intensive while having good growth potential. In other words it is not a "deep moat" business. That means that other companies can easily jump in and be competitors. 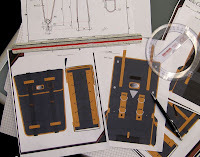 I suspect that there are few proprietary designs, unique products, or exclusivity agreements with manufacturers. A business of this sort is primary based on brand name, marketing, and distribution. So a company, like Velo Orange for example, that has distribution and marketing infrastructure in place could easily jump the moat and be a competitor. But should we be a competitor? I have always been uncomfortable with distributors who set minimum prices or even minimum advertised prices. I also don't like the fact that we can no longer get the bottles without a logo. 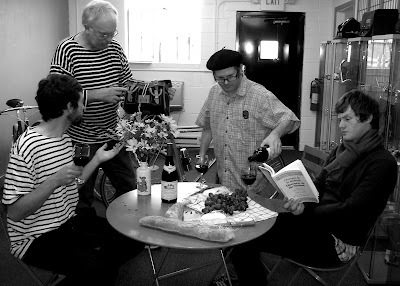 And we can't sell the current bottles to the almost 200 VO dealers. So that's why we've been looking at sample bottles from various factories. A container of stainless steel bottles is not a small investment, but paying for another company's advertising, when we don't benefit from it, is not a wise investment. Hmmm.